The Avengers #189, November 1979 | 'TAIN'T THE MEAT… IT'S THE HUMANITY! I’ve been sorting through some of my old comics (an occupational hazard when you’ve been collecting for as long as I have) and came across this great cover from The Avengers issue #189, published by Marvel in November 1979. I’ve mentioned before that I’m a great fan of John Byrne’s artwork and this cover is one of his best. 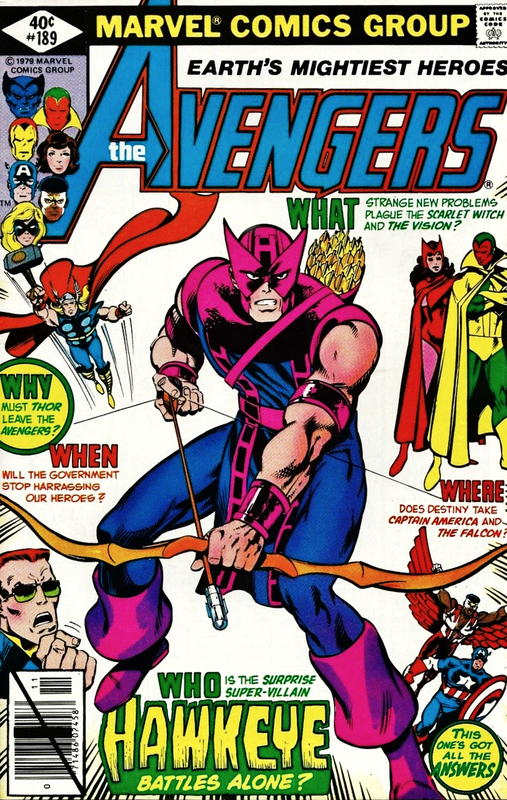 The reader’s eye is irresistibly drawn to a resolute-looking Hawkeye who just dominates the cover, then to the vignettes from the story within that surround him. And the crisp white background helps to make Byrne’s artwork, and the colours pop. This really is a terrifically bold, eye-catching cover from an artist at the peak of his powers. The cover always reminds me of John Romita Jr and Bob Layton’s iconic cover for Iron Man #126, which was published two months earlier. I also have that issue around somewhere so I’ll post that sometime in the next couple of days (work permitting! ).